Can you clarify the terms keyword, subject, and index? Is there a difference between these terms? When librarians talk about keywords—such as asking which keywords you used to search with—they mean the terms that you think describe or capture your topic. Not everyone used the same terms to describe a concept (think about how we talk about vehicles: car, automobile, truck, pickup, sedan, Ford, etc). In contrast, subject and index terms are selected and assigned to concepts by subject experts or librarians. Disciplines have their own official list of terms (such as the ERIC Thesaurus for education), and these are the terms used as subjects. This way, when you search by a subject or index term, it doesn’t matter how the author of the document described or wrote about the concept; the subject term allows you to find all the articles that are assigned that term. Where do I find the subject or index terms for an article in a ProQuest database? Figuring out where to locate the subject/index terms assigned to an article can be confusing at first. The trick is to go into the Abstract/Details for the article. Then you can find the terms assigned to the article in two places in the ProQuest databases (ERIC and Education Database). List in the right-hand navigation bar. This have check boxes so you can start a new search for articles on those terms. Using the check boxes allows you to combine multiple subject/ index terms. Below the abstract. Clicking on one of these terms will start a new search for articles on that term. 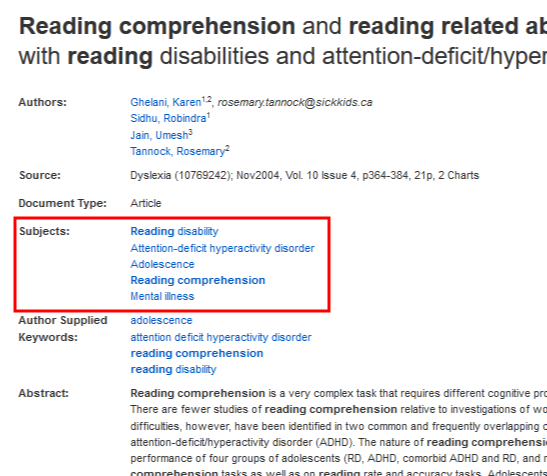 Where do I find the subject or index terms for an article in an Ebsco database? You can find the subject terms for an article in an Ebsco database (such as Education Source) in two locations. Ebsco lists the subject headings assigned to an article on the search results page under the information for the article. You can copy and paste these into the search boxes at the top of the result page. Click on the title of the article to open the record for it. Once you are in the record for the article, you will see the subject terms in a list below the author and source information. Clicking on one of these terms will start a new search for article on that term.